Which is coming with a story. So, some time ago, I was walking in NY with some friends and their friend – first time in my life there – and stepped into a fancy shoe store in Madison Avenue. They started a conversation with the salesman there, who was actually a shoemaker, just being there for educating customers, custom patina their shoes, etc. So at a certain part of the conversation, they were talking about what they do for living.. Banker, whatever.. then the salesman turned to me – “and you Sir, must be a shoemaker”. No, he was not a mentalist. How did he knew? We, shoemakers look the shoes at a different way, than other people – upside down. We are well aware, that upper making is a different craft (even if many of us practice it on a daily basis), so e start at the sole, heel, edge finishes. Not just shiny-shiny, looks good way, but as a sommelier tastes wine, enjoying every little bit of the taste. We know where most of our work goes – the finish. Everybody can make a decent welting, lasting after a certain time of part ice, but finishing is an art (even if I don’t like to use this word for what we do). Finishing is about skills, balance, control and concentration. This is the biggest challenge for most of all – one sloppy move is enough to make your shoes crap. I love finishing, it almost like meditation. I love doing it alone, no chatting, no distraction, just me and the shoes. Years ago I made long list on my wall, which lists it step by step – so I can follow the same way all the time… and I never do. So, enjoy the look of these shoes – just off the last, soon they will be on my customer’s foot, who hopefully happily will wear them for long years. 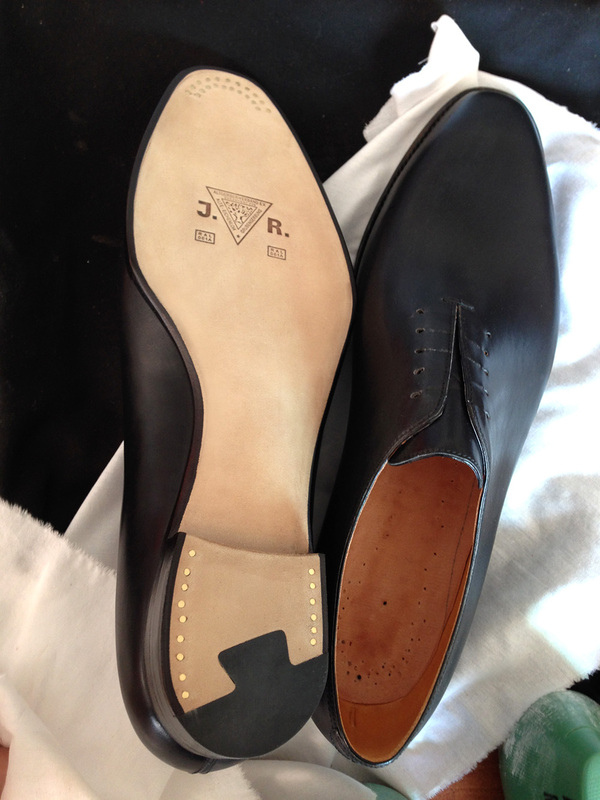 A very moderate fiddleback, new, matt sole finish, a sole channel, what – I believe – only I do, new style from brass nails, and hidden welt (and bevelled) waist. The last is my old-new 224. (old as I designed it several years ago from a block of wood, new as I redesign it every single year a bit – some millimeters here and there). This one is 224/2013. ps. new, professional pictures will come soon. Your soles.are magnificent and as a person new to your craft I need guidance in a place to buy soles for women’s shoes.